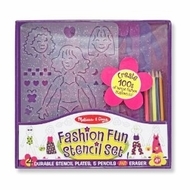 Your little fashion designer will be ready for the runway with the Melissa and Doug Fashion Fun Stencil Set! Each set includes 4 durable plastic stencils that allow your child to choose, design and decorate their models look. Vivid colored pencils and an eraser are also included to style next seasons hottest designs!